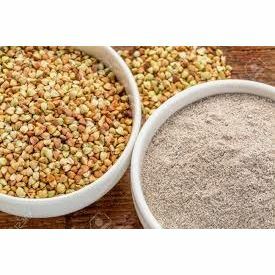 Buckwheat flour is a high fiber, high protein alternative to white flour. It is also higher in many essential vitamins and minerals than white flour. You can use buckwheat flour in place of white or whole-wheat flour in many recipes, including those for muffins, cookies and breads. Directions of use - 1. Take required quantity of Buckwheat flour and prepare soft dough using hot water. 2. Roll chappathi / roti smoothly with the help of a rolling pin, roll them into a thin disc. 3. Heat flat pan and place chappati / roti over it, cook evenly till brown spots appear on both sides.